Our unemployment insurance program has served this country well since 1940. When the Great Depression gave rise to mass unemployment and large public demonstrations, workers demanded a program of unemployment insurance to address the obvious, painful need. They were supported by mayors, business leaders and others who understood how important an income replacement program was for families trying to weather bad times and for communities trying to maintain economic stability. The program has continued this vital role in the decades since and especially during periods of economic crisis. It is deeply disturbing to watch your government now make such destructive, harmful changes to our EI program. There is no excuse for such unilateral action. The people directly concerned have not given their agreement or even been consulted. Since 1990 workers and employers have entirely funded the UI/EI program without any government contributions. What’s more, between 1994 and 2009, the funds of the EI program were used for other purposes than the protection of workers; those funds should be restored. We are united in calling on your government to Scrap the EI Changes! EI requires improvements that improve access, duration and benefit levels. Less than 40% of unemployed people are now collecting EI benefits. the erosion of coverage for people without full-time, full-year employment. Temporary, part-time and migrant jobs mean insecure, erratic employment, especially for aboriginal workers and workers of colour, women and youth. the attempt to dismantle our EI social insurance program by stealth. 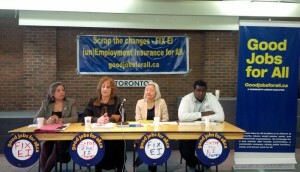 Rescind all 2012 and 2013 Budget measures related to EI. Improve access by reducing qualifying hours in all regions to the lesser of 360 hours or 13 weeks. Increase duration to at least 50 weeks in all regions. Provide a Special Extension when unemployment exceeds 6.5%, paid from federal general revenues. Increase benefits to at least 60% of earnings using workers’ 12 best weeks. Raise the maximum benefit. And eliminate severance pay allocations and the 2 week waiting period. Provide EI income benefits so long as workers are in approved training. Expand supports for work-sharing arrangements under EI to reduce layoffs, and build links between work-sharing and training. Provide Temporary Foreign Workers with meaningful EI entitlements.